On Friday, a Klukwan resident set out to pick blueberries in the Upper Chilkat Valley. When he didn’t return, an extensive search began. After two days alone in the woods, he was found alive and well. When 74-year-old Valentino Burattin found himself lost in the woods, he didn’t have any food or water with him, aside from a bucket of blueberries he’d harvested. “Blueberries, they are good, but when you are thirsty, they don’t satisfy,” Burattin said. Burattin, a Klukwan resident originally from Italy, was berry picking near Porcupine Rd. and Sunshine Mountain, in a heavily wooded area around 28 miles from Haines. It’s a popular spot for berry picking. Burattin had only set out for an afternoon trip. That was on Friday. “I went berry picking and at the end of — I think it was about 5:30 p.m. and I said ‘okay I can go down.’ But instead of going straight down and following the same trail that I had in coming up, I said ‘oh, I can go down this way,’” Burattin said. But the direction wasn’t quite right, and instead of getting back down to his car, Burattin walked Friday evening and all of Saturday, until he was found on Sunday. During that time, a lot of people got involved to help search for him. The police, fire department and local residents from Haines and Klukwan started an initial search. Community members were present throughout the weekend. By Sunday morning, the Alaska State Troopers took over the overall search operation. 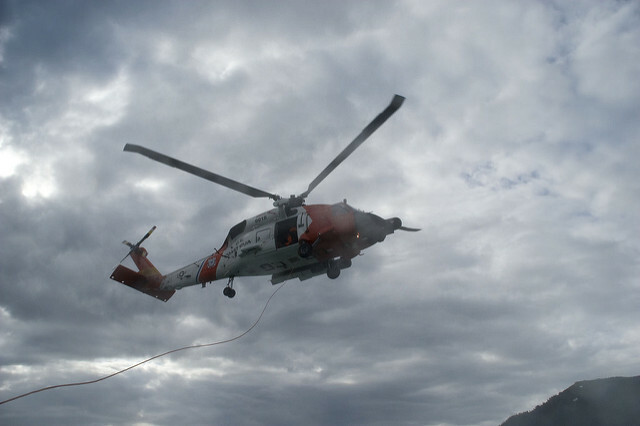 The U.S. Coast Guard also got involved, sending two helicopter aircrews from Air Station Sitka. A local search dog was deployed, followed by additional canines from Juneau. Search and rescue teams from Skagway joined those in Haines. The Skagway Fire Department aided in the effort. So did Alaska Mountain Guides, a local tour operator. According to a dispatch from the troopers, Burattin decided to stay in one place and wait for help after becoming disoriented. Brad Ryan is in charge of emergency operations at the Haines Borough. He’s there to provide borough support in situations like this. There were crews on the ground, and in the air. Ultimately, Burattin was spotted and picked up by a Coast Guard helicopter. Ryan said the team on land helped with the successful effort in the air. “All that effort on the ground, people put a lot of hours in, I think allowed the Coast Guard to put in a pattern that was wider and ended up finding the gentleman. As well I think he was in the open, which was huge,” Ryan said. Ryan said local forester Greg Palmieri, who has a lot of experience in the area, joined the helicopter crew and helped carry out a wider search. Burattin was found at Walker Lake, a good distance from where his car was parked. As he was spotted, he was in the process of writing a message. “When I saw the helicopter I started crying and giving praises to the lord,” Burattin added. Burattin had been out harvesting blueberries, but he credits his survival to a different berry. “What saved me was eating the watermelon berry,” Burattin said. Burattin said he ate them constantly, and they kept him hydrated. In a press release about the rescue, the Coast Guard offered a few more survival tips: always carry a GPS and a map, and tell someone where you’re going before heading out. Burattin says throughout the ordeal, he always believed he would make it out of the woods. Burattin returned to his family Sunday evening, after being seen by medical personnel. He was reported to be in good condition with no injuries. As for the blueberries he had harvested, he had to dump them out to gather water in his bucket.